LOS ANGELES - Oct. 10, 2017 - PRLog -- The United Premier Soccer League (UPSL) is pleased to announce Matt Kahla as Texas Conference Operations Manager. 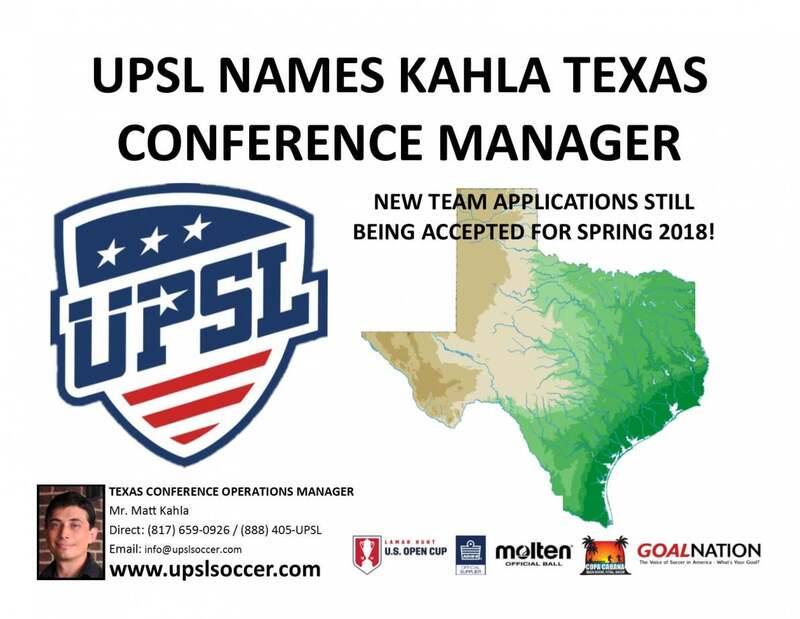 Kahla will promote UPSL's Pro Development structure to local Texas teams and clubs that fit with the league's model. United Premier Soccer League Commissioner Yan Skwara said, "We are very pleased Matt Kahla has worked his way into the Conference Manager position. Matt is very passionate about his role with the league and has proven his capabilities with us early off as a Texas Conference Ambassador. We felt now was the right time to promote Matt to Texas Conference Manager and let him continue to effectively grow the UPSL Texas market and build a dynamic conference made up of quality Pro Development teams." Kahla, 31, was the Marketing Consultant for FC Cleburne (USL PDL) during its inaugural first season in which it led its division in attendance. United Premier Soccer League Texas Conference Operations Manager Matt Kahla said, "I'm honored that UPSL President Leonel Lopez and Commissioner Yan Skwara are ready to work together to bring the UPSL to Texas. Soccer in Texas is big, with some of the largest youth tournaments in the world taking place in our state every year. The UPSL has a place in this great state, and I look forward to expanding the UPSL as well as growing the Texas market." Kahla does marketing and graphics for Tuxedo Automotive in Cleburne, Tex., and has worked as a consultant for a number of Pro Development teams throughout Texas. "My goal is to bring together many of the quality Pro Development teams scattered across this great state," Kahla said. "If you're a player or coach in Texas there's a new opportunity to compete at a high level with the UPSL Texas Conference." The UPSL was formed in 2011 and currently includes more than 90 teams in Arizona, California, Colorado, Florida, Georgia, Idaho, Massachusetts, Nevada, New Hampshire, New Jersey, New York, North Carolina, South Carolina, Texas, Utah and Virginia. UPSL is the fastest growing Pro Development League in the USA, with 100-plus teams targeted for 2018 Spring Season. Each UPSL team is individually owned and operated, and is responsible for maintaining either UPSL Pro Premier Division or Championship Division minimum standards.